Skipping Breakfast is a Big NO- Go for Ayurveda Breakfast Recipes! If you wonder why you get irritated in your office, home and everywhere, you might be skipping breakfast often! Ayurveda says- “Don't Skip Breakfast” Why? Because fasting irritates pitta, vata, and kapha dosha, particularly the sadhaka pitta which is responsible for maintaining an even temper and when in balance, brings joy and contentment. If sadhaks pitta gets imbalanced, it leads to unsettled emotions and thus irritability. So, start having breakfast right from tomorrow morning to be in a good mood always! Now if you are habitual of skipping breakfast, it might be a little difficult for you to break this habit. However, nothing is impossible- you knew that earlier too! Ayurveda suggests that the first food in the morning should be a fruit or something that is very light and easy on your digestive system. For example, fruits that are best for breakfast. Morning is also the best time of the day to get maximum nourishment from fruit. There are many other options for healthy breakfast. If you want to know what all foods fall in Ayurveda Breakfast Recipes, read the list below. Dried figs and raisins- soak them the night before or simmer with a little water for about half an hour. Dates with a small dab of ghee (clarified butter) replacing the pit. Chapati with raw honey and warm milk. Oatmeal with raisins and chopped almonds. Almond powder mixed with warm milk. Stewed Apples and Pears- Take 1 apple, 1 pear , 1 tbsp raisins, 1 clove, and 1/4 cup water. Peel and chop fruit into small pieces. Add water, raisins, clove and bring to boil. Then cook on low heat for about 20 minutes or till the fruit changes into tender consistency. 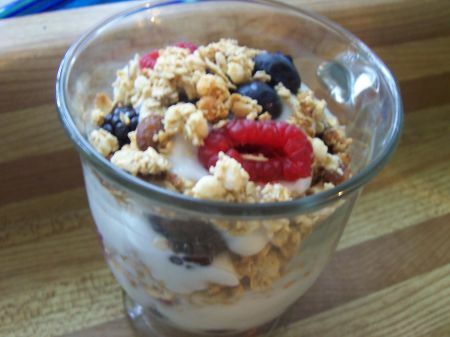 Have this warm healthy breakfast. Hot cereals like “Dalia”- Add a tbsp each of roasted broken wheat, split gram, rice, sesame seeds with half tsp of carrom seeds and salt to your taste. Add water in double amount (or a little more based on consistency that you want). Pressure cook or simmer for about 30 minutes or till it gets tender. Have it warm. You can also have fruit juices like the blend of fresh carrot, cilantro and zucchini, or fresh sweet grape, apple, or pear juice. However, avoid having orange juice on an empty stomach as it is too acidic. Also, your juice should be at room temperature or a little cool. Never make it ice-cold. I will try this breakfast and get back to you. It looks very good and nutritious. Thank you for the great recipes I am excited to try them out! !